South Shields left-back Anthony Callaghan is to have surgery. Picture by Peter Talbot. 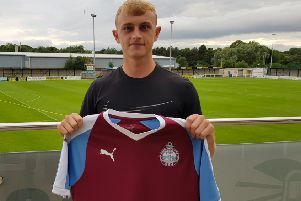 South Shields left-back Anthony Callaghan is to undergo surgery next month as he continues his recovery from a back fracture, writes Daniel Prince. Callaghan has been sidelined since playing for the Mariners against Kendal Town on Boxing Day last year. Numerous treatment options have been explored in the last seven months, and it has been decided that spinal surgery is the best way forward for the 24-year-old. 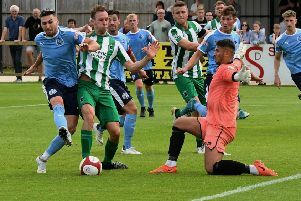 Callaghan, who has made 49 appearances for Shields since joining from Washington in October 2016, is hoping to have recovered in time to compete for a place in the team during the Christmas period. He is currently on a pre-operation programme with club physio Andrew Morris in a bid to aid the recovery process. The full-back is confident that when he does return to the pitch, he will be fitter and stronger than ever before. He said: "I'm hoping to be back between three and four months after the operation if all goes well with the rehab. "I want to compete for my place again. "I'm a young, fit lad and I tend to pick up fitness quite easily, which should help the recovery process. "If I do make it back near Christmas, that could be a great time for the team when there are lots of games. "Then it'll be up to me to do everything I can to get back in the team." Callaghan was a key player for Shields during the first half of last season, and played an important role in the club's run to the final qualifying round of the FA Cup. His form leading up to the injury has made his time on the sidelines all the more difficult to accept. He added: "Before I picked up the injury, I was in the team and playing really well. "That is what has made this all the more disappointing and frustrating. "I had been playing in all the big games, and to go from being on such a high to rock bottom has been tough to deal with. "It has been a long process of exploring every option for recovery, because surgery is seen as the last option. "Every other option has been explored to try to avoid it, but it needs to be done. "I just need to get my head down. I can't wait to get the surgery done, because there will be goals for me to hit after that." Callaghan has been a regular at games and training sessions throughout his time on the treatment table. He is eager to get back on the pitch alongside his team-mates. He said: "It's frustrating seeing all the other lads training hard and playing in pre-season when I've got to watch from the sidelines. "I'll be even more motivated when I come back because of this experience. "I'll flog myself and get as fit as I've ever been. I'll be fitter and stronger than I've been before. "I've been reassured that once I've had the operation, there shouldn't be any setbacks." Callaghan will continue to work with Morris as his comeback is stepped up. He has paid tribute to the physio, as well as joint managers Graham Fenton and Lee Picton, for the support they have given him during his lay-off. He added: "Andy Morris has been brilliant. "He has supported me so much throughout the process and I'm working really closely with him now ahead of the operation, and will continue to do so afterwards. "Lee and Graham have been brilliant too and have made sure I've been kept involved with all the lads. "I just can't wait to be back out there."